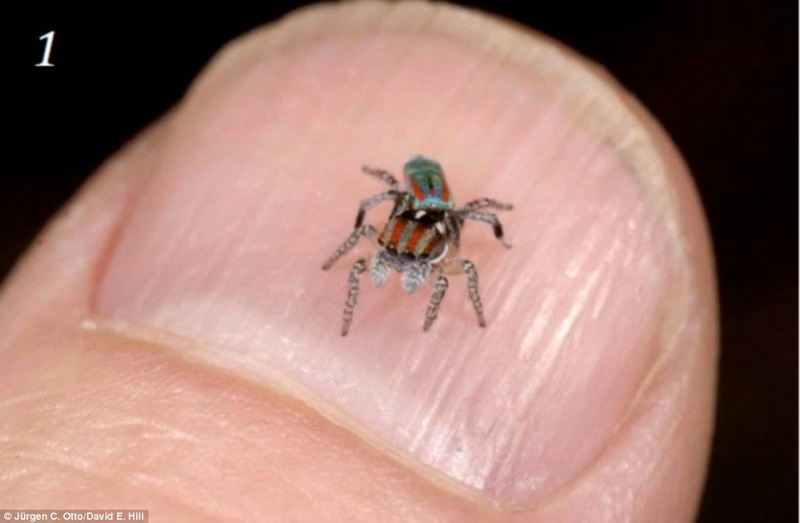 Peacock spiders are members of the jumping spiders family, renowned for being tiny. Adults only grow up to around 5mm in length.Maratus volans from Ku-ring-gai Chase National Park near Sydney. This adult male is displaying to a female he's spotted, with large extended and elevated opisthosomal fan, and extended legs III. One of the most common phobias in the world is arachnophobia, the irrational fear of spiders. 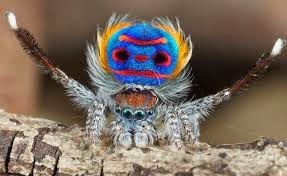 But there is one sort of spider out there that is so cute that even arachnophobes may like them. I am talking about those diminutive jumping spiders (Family: Salticidae). Not only are these spiders very small, but they are generally colourful and they have keen eyesight -- essential for stalking and quickly jumping upon their prey since they do not spin webs to ensnare insects. It's possible that I may be projecting just a wee bit, but jumping spiders seem to have personalities and, as one zoology professor told me when I was a grad student, they even learn to recognize their human care-givers.